Size: Our men's sock translates to an 8-12.5 shoe size. 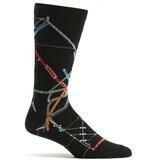 Because of the stretch in our socks, those with a slightly larger foot should not have a problem. These socks go up to about the bottom of the calf.